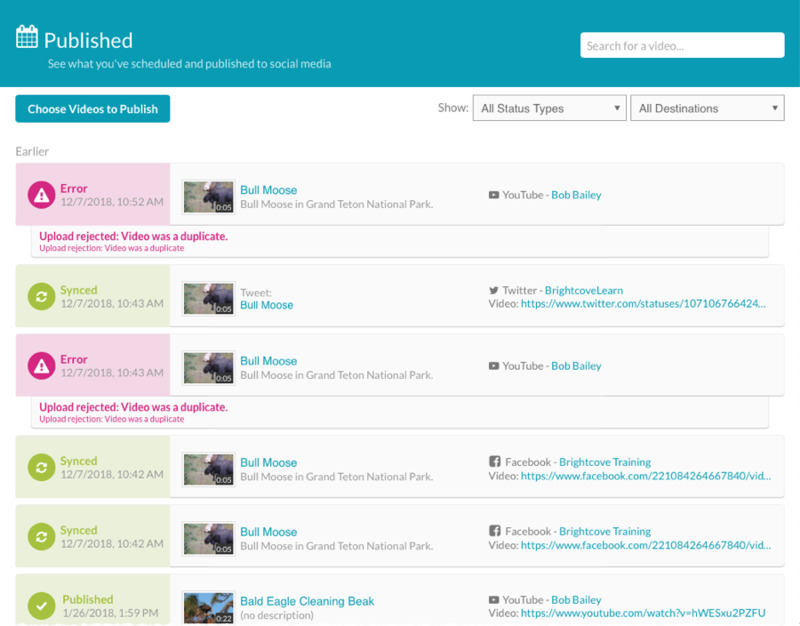 In this topic you will learn how to monitor the status of videos that have been posted, or are scheduled to be posted, to your social media accounts using Brightcove Social. When you open Brightcove Social, or click Published in the left navigation, a list of videos published using Brightcove Social will appear. Note that if Auto Sync is being used and the sync rules are configured to update video metadata on the social platform, multiple entries for the same video may appear in the list. For example, an entry will appear when the video is first synced and then additional entries will appear if the video metadata is updated and synced to a social platform. Below is a list of common publishing errors that may be encountered. YouTube - Upload rejection: Video was a duplicate. YouTube doesn't allow the same video (as determined by comparing digital fingerprints of the uploaded video binary, not by Video Cloud video ID) to be uploaded to a channel more than once, and fails attempts after the first with this error. NO_RENDITION_FOR_SOCIAL_PLATFORM_ERROR. The Social module couldn't find a Video Cloud video rendition that meets the platform's video requirements. The most common cause of these by far is publishers with Twitter auto syncs tagging videos that are greater than 140 seconds (Twitter's maximum allowed duration). YouTube - The request metadata specifies an invalid or empty video title (as part of a longer error message). YouTube has a maximum title length of 100 characters, so when using auto sync, if the Video Cloud video metadata that gets mapped to the YouTube title is too long, this error will result.